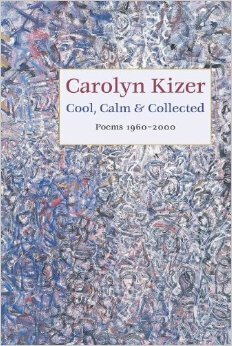 When Kizer’s Cool, Calm and Collected: Poems 1960–2000 (Copper Canyon Press, 2001) weighed in at a whopping 400 pages, readers were surprised both at the prolixity and the heft. Organized by decade rather than by publication, Kizer’s book seemed a recognition of the formal unfolding and elemental power of chronological narrative, and was in effect a wager that the justice of time transcended time’s erosions. Against the calm suggestiveness of classical entablature, framing the caryatids of her youth, there now stands, thanks to the block layout of contents, five decades worth of work, in which spin the demotic rush of particulars, of facts. As if in answer to Robert Lowell, who once wondered why invention had to be seated ahead of “what happened,” the march of poems in Kizer’s Collected alternates between lyric and narrative (with the latter seeming to take up more space in later years), dramatizing the most recognizable dynamic in her poems: the actual, remembered past confronts the idealization of event that yearns to transform fact into myth— which is to say, to remove it from history, from narrative—away from further imperfection. The straightforward chronological arrangement demonstrates not only the evolved contours of a career that moved from the 1950s’ neo- Metaphysical formality à la Roethke, Kunitz, Adams, Bogan, et al., through a depressurized period of Chinese impersonations, which we may interpret also as a declaration of independence from east coast aesthetic expectations (back when such distinctions still mattered), to a stretch typified by the brilliant, bipartisan conspiracy of formal achievement and organic, open poetry. Kizer’s Collected also reveals an evidentiary dimension impossible to ignore. We find no dry periods, no queer gaps requiring explanation: the days and years, grinding as they can be, awful as they may seem through history’s lens, made memorable, forward-thinking poems possible, not—as was too often the case for her peers—impossible, or scarce. In every decade, there are poems aware of the fault-lines worn by their occasions, passionate alike in love and denunciation, never merely witty when they can be hilarious, never sad when they can be heartbreaking, Olympian, or self-justifying. Intuition knows that ends and beginnings touch, although self-divergence, as Elizabeth Bishop told us, paradoxically mediates such wholeness as it may be our lot to achieve. Wittgenstein likened human life to a rope: although no individual strand goes all the way through, the rope is continuous. What is continuous in Kizer are the conditions for lyric expression, combined with the sense of poetry as a discipline whose longed-for outcome is the union of image and voice underwritten by occasion. ++++++++++++… Come, tease me a little! Reading the early formal poems for many years now, I have always been struck by the fineness of the inlay—not only a reflection of the artisan’s pride in construction and line, but of the subtler and, at present very much out- of-fashion notion of “finish.” This is the stylistic closure that implies not fidelity to a mimetic ideology, but in Nelson Goodman’s sense, a “world-making.” In other words, poem-making is not situated among occasions ready-made for recording; rather, it is represented as invention. Robert Lowell called attention to a similar distinction in the 1970s and registered his anxiety not only that invention (world-making) was hard, but that simple mimetic acts—descriptions, say, of facts and states of affairs—might be beyond his—or anyone’s—grasp. As a poet, Kizer has been blessedly free of such anxiety, and this confidence in the power of words to stay where they’ve been put gives her literary production a sense that authorship and authority are not simply cognates but synonyms. In this, she is perhaps less postmodern than she fears. While feminism too began to drift into layers of ambiguity and self-consciousness, what set Kizer’s poems apart was their allegiance to an old, and if possible, even older-than- thou way of saying things that seemed essentially new. Kizer gravitated to the work of like-minded old-schoolsters like Louise Bogan, Leonie Adams, Rolfe Humphries, and Ruth Pitter, and set her allegiance there before she ever took up with the likes of Robert Creeley and Denise Levertov. This fact both predates her feminism and, when it emerges, keeps it from becoming ensnared in its own curlicues—which has been the fate of both feminism and American poetry itself, when left to the ironic patronage of the academy. “ You women have no major philosophers. ” We know. of water, shifts in turn from satire to narrative to meditation. The distance from there to here may be charted by innumerable graphs, but none is more telling than the graph that discloses a poet’s willingness to mill privacy into public discourse while managing to retain its affective skin. Many of Kizer’s best poems go back to biography and emerge as situated memories, memoiristic descriptions leading inescapably to judgment, with a number leading—as with her poem of seeing (and being seen by) Professor Einstein ( “ Twelve O’Clock”)—to spots of time pure enough to suit Wordsworth. Nor did the increasing forays into memoir and—inevitably—elegy spell a loss of rhetorical muscle-tone. T hat outer coat for which she has been praised was still being worked until the last published work, though the application is more relaxed, more settled and timed by event and recollection than predestined by form. And there is at every turn that beautifully controlled (and controlling) vernacular. Since the start of her career, Kizer has made no secret of her foundational opinions and bona fides. Looking back at her history, you notice the poems to her father, a prominent lawyer from Spokane, who overlooked the comforts of provinciality in favor of an old- fashioned insistence on the reality of art and one’s duty to be politically forward- thinking. There you also find her mother, the first Ph.D. in her state (in biology), and Kizer herself the late and only child of this enlightened couple, who gave her a sense of self-possession and reared her to believe herself capable of orienting her imagination in terms of horizons unavailable to others her age. Who but an artist could incorporate such a congeries and keep course, let alone a straight face? Reading the old poems, I have been moved by the force of their elemental rightness, their intricate solidity, hilarity, savoir-dire, existential coherence, and joy in the face of every challenge to the persistence of these qualities (challenges that are often the subjects of the poems themselves). Rereading Kizer, I have been struck by how every deployment of theme invites variation so that an outward-facing, yet self-referential figure begins to emerge with a force resembling logic. This is something you don’t see enough of: poetic logic, played out over the course of a career. But it must be said, too, that the work of a lifetime—a poet’s collected poems—can inspire ambivalence both in the reader and in the poet herself. On the one hand, there is the understandable urge to sum up, to take the measure of time, which otherwise takes the measure of us. The same urge may occasion regret in the reader: when we approach an aggregate, aesthetic whole—an oeuvre—the figure that this work makes may lose its mystique to the need to be comprehended. Since her debut in the 1950s, Carolyn Kizer has moved at a pace that seems in retrospect the inevitable andante, from presence to eminence, through the decades, but with this gradus comes the danger that one’s reception will grow less amenable to criticism and gravitate more toward blind reverence—or worse, forgetting. Nevertheless, there is a utility to a volume like this: it trains us to stay on point, not to be dazzled by reputation, but rather, as she puts it in “Pro Femina,” encourages us to “get back to the meeting.” Which means, more broadly, that the limited aesthetic wholes we call poems, for all their fit- and-finish, formal rectitude, sensuous satisfaction, and thematic closure, invite us to consider deeper involvements beyond pure contemplation. Unconvinced by the didactic, yet not content to be merely personal, Kizer’s work connects the dots between private and public dreaming by suggesting that private utterance can only derive authority through public ears and the mediation of cultural memory. For her, Herzen’s famous “ What is to be done? ” is not rhetorical. David Rigsbee is the author of The Red Tower: New & Selected Poems (NewSouth Books, 2010) and The Pilot House (Black Lawrence Press, 2011). In 1990, he edited the first critical book on Kizer’s poetry, An Answering Music: On the Poetry of Carolyn Kizer (Ford Brown & Co.). This review appeared originally in the Spring & Summer 2011 print edition of Poetry Northwest.